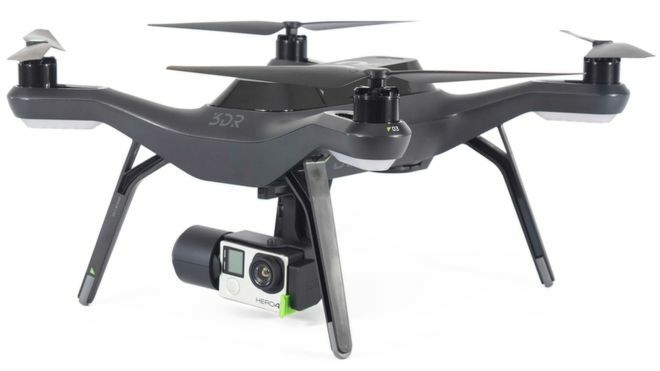 Most likely, your expectations for the age of drone delivery involve cute li’l quadcopters that descend onto your porch with a gentle bzzzz, deposit a box of diapers or a pizza or whatever else you just ordered online, before zooming back to base, ready to deliver the next whim. That’s the vision pitched by the likes of Amazon, UPS, and DHL, and it’s an appealing one. 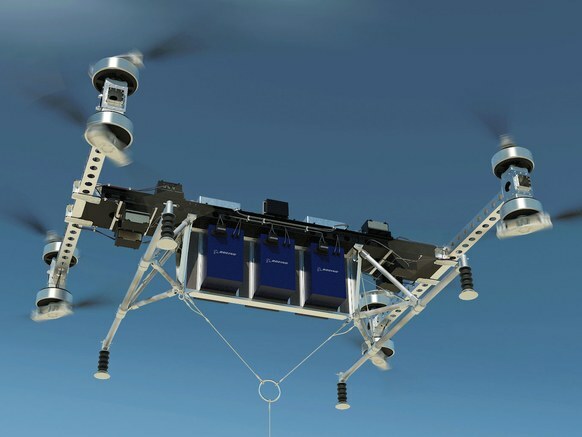 Boeing has a different idea for delivery drones, one that’s bigger by an order of magnitude. Last week, the aerospace giant revealed a prototype for an electric, unmanned cargo air vehicle that it says could haul as much as 500 pounds—that’s 400 large Domino’s pizzas or 11,291 newborn-sized diapers—as far as 20 miles. But this big buzzer isn’t going to your house. In fact, Boeing isn’t quite sure where it’s going. “It’s a concurrent exploration of a nascent market and nascent technology,” says Pete Kunz, the chief technologist for HorizonX, the Boeing skunk works-venture capital arm hybrid division that built this thing (the marketing team hasn’t given it a catchy moniker yet). A team of 50 engineers spent three months building what looks like a car-sized Erector Set, fitted with eight spinning blades (each six feet from tip to tip), and weighing in at an auspicious 747 pounds. It navigates and looks for obstacles using components and software provided by Near Earth Autonomy, a Pittsburgh-based company in which HorizonX invests. Now that the drone has completed its initial round of testing, done indoors at Boeing’s autonomous systems lab in Missouri, the team can start building up its skills. This first prototype can fly for about 15 minutes and carry 150 pounds, but Kunz and his team are confident they’ll reach that 250-500 pound capability before long. They predict it will fly between 60 and 70 mph and as high as a few hundred feet, plenty fast and high to do short hop deliveries. This kind of vehicle may not fit into your drone delivery fantasy, but it has practicality on its side. “This starts to sound like the kind of thing that can do things in real life,” says Drew McElroy, CEO of Transfix, a trucking brokerage firm. As home deliveries have grown in popularity over the past 15 years or so, he says, shipments have gotten smaller, and more targeted. The old model—trucks haul supplies to Walmart, people drive to Walmart and bring home their shopping—is evaporating. Any vehicle that can fill in the gaps between the huge bulk shipments that move by sea and the shoebox-sized packages that come to our doors can play a role. Plus, a drone made to reach places like oil rigs or islands connected to the mainland only by ferries, might be easier to get into service, says Anne Goodchild, who runs the University of Washington’s Supply Chain Transportation and Logistics Center. “This scale of delivery is probably closer in terms of practicality than smaller drones.” Myriad regulatory and political issues stand between swarms of little drones and urban America, whether they launch from distribution hubs or rolling trucks. Flying around more rural and controlled environments (where you can have things like designated landing pads) should be easier. And few companies know as much about building and certifying aircraft as Boeing. So maybe you’ll still have to listen for the brrrrrng of the doorbell instead of the buzzz of the drone to get your diapers and Domino’s at home. But if you live on an oil rig, maybe that will change soon.